We will be closed Monday September 4th to celebrate Labor Day. See you on Tuesday! WE ARE CELEBRATING PAKISTANI AND INDIAN INDEPENDENCE DAY! 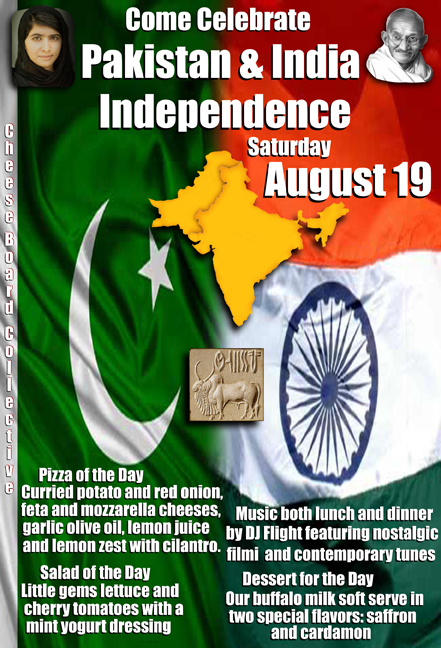 SATURDAY AUG. 19 with buffalo milk soft serve in two special flavors: saffron and cardamom. We will also serve our special curried potato pizza. The Pizzeria is closed August 8th through August 14th for our summer vacation. We re-open on August 15th.